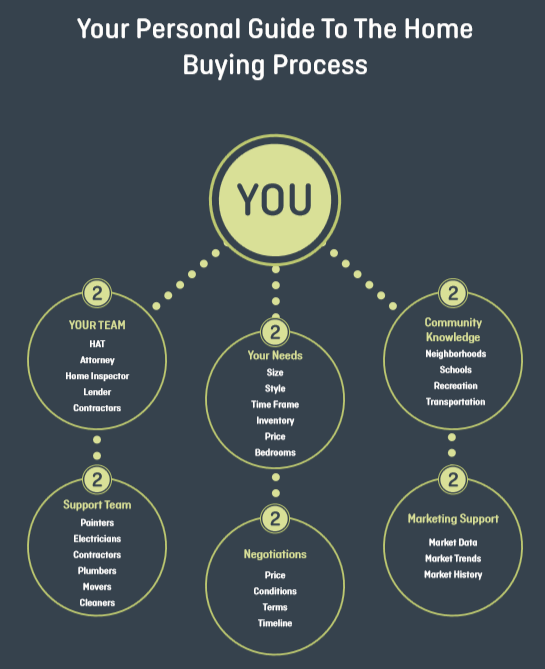 If we had to sum up the buying process in two words it would be these: Process and timing. Process and timing are two key components to buying a home, but they’re also the most complex and difficult to understand. The process of buying a home can seem like a daunting task, in most cases, it is and even more so in today’s crazy real estate market of low inventory. It is more important than ever for buyers to see the big picture – and then break it down step by step. This means having a thorough understanding of the home buying process and having a clear list of priorities (What town to you want to live in? Which neighborhood is most desirable? What schools are preferable? Why type of home? Which amenities? etc.). This must go hand-in-hand with an understanding what needs to happen in order to buy a home (schedule open houses, structure the offer, plan financing, arrange for an inspection, understand contingencies, prepare for closing, etc.). And that’s just the tip of the iceberg! Understandably, buyers don’t often have answers to these questions. If they’re going it alone or working with a real estate professional that is not from the area, it can be very difficult to get a grasp of aligning your preferences with the sequence of events that also need to happen. Timing is right up there with process. If you don’t have all of your ducks in a row going into the home buying process, important details could fall through the cracks and jeopardize your odds of getting that home you’ve always wanted. Time is of the essence, and if it takes you 3-4 days to find an attorney, lender or inspector, it’s going to add stress to an already stressful situation. A good real estate team has relationships with people they already know and trust, which minimizes surprises and speeds the process along. Our goal as a real estate team is to educate buyers throughout the entire home buying process – soup to nuts. We understand that you’re not just buying a home – you’re buying into a town, a location and a lifestyle. As the #1 real estate team in Arlington, we move more home buyers from beware, to prepared, to their new home than any other team in town. If you are thinking of buying, contact us today and we’ll put you on the right track to buying your next home.